I had a big and bulky air compressor that stayed in my garage all the time, but all it really did was collect dust. It had a lot of air pressure, but it was limited in what it could do since it was too heavy to move anywhere. But then I ordered and received the Dewalt DWFP55126 Pancake Compressor that solved all my needs! Immediately when I opened the box, I knew this was exactly what I’ve needed for a long time. It was compact enough to fit in a box about 3-feet by 3-feet, and it didn’t weigh a ton. The clean appearance and portability was evident as soon as I opened it. Many pancake compressors require a break-in procedure when you take it out of the box. This one does not require that, and it won’t affect the long-term use either. In fact, a Dewalt customer service agent said that the break-in procedure must be used in older models, but this one has upgraded technology and doesn’t need it. It won’t hurt if you still want to do it, but it’s not necessary. Right out of the box you just need to screw in the female quick connect and plug it into the Dewalt portable air compressor and it’s ready to be used. You will need to supply your own hose and connector, though, since it doesn’t come with any accessories. It’s that simple, but I always like to read the manual to make sure I’m doing everything properly. I don’t work with new compressors regularly enough to know everything about them, so I think it’s always best to at least skim through some of the main highlights in the manual. Buy It on Amazon.com NOW ! When I tried the pancake compressor out for the first time, it appeared to work perfectly. However, I noticed that the psi was not holding after a couple hours. Upon further investigation, I found that the hose fittings had slow leaks because the bearings are too small inside the fittings. Luckily, I had some bigger fittings lying around that I replaced the small ones with. If you don’t have that luxury, then you will have to deal with the leaks or ask them to ship you some bigger ones. Alternatively, you could try some Teflon sealing tape, but I can’t tell you if it would work since I didn’t have any on hand to try. If yours seems like Dewalt DWFP55126 Pancake Compressor isn’t holding a steady air pressure, then get some soapy water and rub it around the joints. You will be able to find the leaks if the water bubbles because of the air flowing out. I’ve seen where other people have taken it to a Dewalt repair shop to get the issue fixed, but if you’re like me and use it all the time, you don’t have time to wait for it to be returned to you. Compared to other compressors that I’ve owned, Dewalt DWFP55126 Pancake Compressor is one of the quietest. From my experience, it has gotten up to the advertised 165psi quite easily, so it is easy to air up tires and anything else that needs a lot of pressure. I don’t have a lot of large machinery, but this compressor has come in handy for everything I have at the house. The six-gallon tank is plenty for me and likely would be for most residential uses. 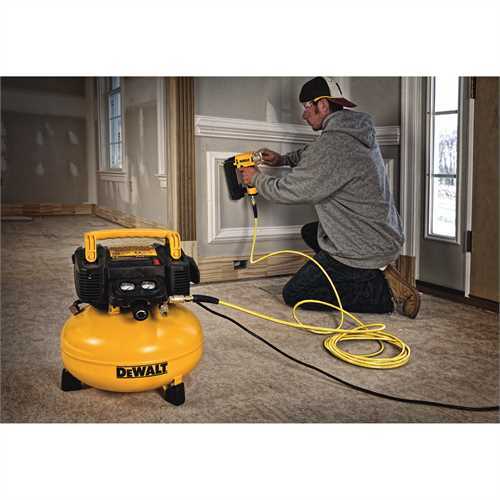 If you can lift about 30lbs with ease, then you’re going to love this Dewalt air compressor. It is light enough to carry anywhere and is easy to load in the back of your truck to transport. I’ve had neighbors and friends ask me to borrow it occasionally because their big and bulky ones are just too inconvenient. I’m not much of a multi-tasker most of the time, but if you are, then this compressor has two ports where you can use airbrushes, nailers or even impact wrenches. I can see where this would be a very handy feature if you have a couple people working on something where you would need air for two different pneumatic tools. When I go out to my other property, it’s almost inevitable that I’m going to have a flat tire in my ATV. That used to be a headache for me, but now I don’t even get frustrated because I know Dewalt DWFP55126 Pancake Compressor can easily fill up the tire. I’ll get the tire fixed one day, but until then, I know I can count on my Dewalt compressor. I also take this portable air compressor for car anytime we go camping or do any other outdoor activities. You never know when you’re going to have a flat tire or just need some air pressure. It’s usually the first thing I pack! Luckily, I haven’t had to use it on trips for myself, but a couple of my friends sure are thankful that I brought it. The best part is that it’s compact enough to fit just about anywhere. Whether you are transporting it in the back of your truck or in an RV, you will find a place for it. I have a smaller one-gallon compressor that works well, but I decided to upgrade to the six-gallon compressor because sometimes I need more air capacity. It’s the perfect blend of portability and still being strong enough to get most jobs done. The six-gallon tank is great in my opinion because it may be too heavy if it had a larger air capacity. A couple of the older air compressors I had also required a lot more maintenance than this one. Since it has an oil-free pump, you hardly have to do any maintenance with it. I don’t have time to be fixing things all the time, so the less maintenance required, the better. As long as you keep it clean from dust and debris, you may never have to do any maintenance on it. 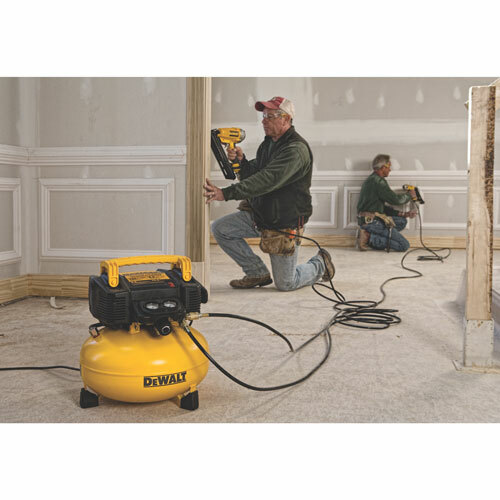 You’re going to find a lot of positive reviews about the Dewalt DWFP55126 Pancake Compressor, and I can honestly say that I agree with most of them. The only problem that I had was the slight leaking, but I was able to easily fix that. Otherwise, the compressor is well worth the money, and you will find yourself using it a lot more than you initially think. If you are not satisfied with this product, you can click Makita MAC2400 Air Compressor Review to read more info.